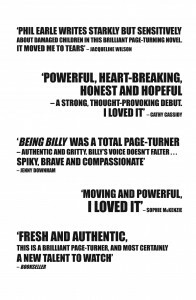 I’ve banged on before about word of mouth and how important it is to the success of any book, so it’s been really lovely these last couple of weeks to start hearing back from people who’ve given the proof copies of ‘Being Billy’ a whirl. Obviously, it’ll be fascinating and humbling to talk to kids in the midst of similar situations to Billy, to hear their stories, to see how much life in homes has changed since I worked in them in the late 1990’s, but at the same time, what if they don’t relate to what I’ve written at all? I’ve never lived through the things they have. I was a carer (or as Billy calls them ‘scummers’), on the other side of the fence, someone who was lucky enough to have a family to go home to at the end of the shift, so how can I possibly imagine what it must be like to live their lives? I suppose this is the biggest challenge for anyone writing, to capture a level of authenticity, to enable the reader to say ‘yep, that’s exactly how I feel’. And that’s why writing for kids or Young Adults is such a fantastic challenge, because they are the harshest critics. Why would they waste time wading through a book that they aren’t enjoying or can’t relate to, when there a hundred other things fighting for their attention…the simple truth is, they won’t, and this thought always keeps me on my toes when I’m writing. Anyone who knows me will tell you I spend too much time worrying, my old boss even nicknamed me Eeyore for that very reason, so I’m keeping all this in check, trying not to let the worry take over, remind myself that I have got inside Billy’s story after all. I got a message this week from a lady I’ve never met. She got in touch via Twitter, and her message really made me smile. She liked Billy enough to get in touch and tell me. She even went as far as posting a review on the Puffin website, and I’ve decided that whenever I worry about whether I’ve got inside Billy’s head, I’ll just give it a read. Original blog post appears here. Publishers have spent years in windowless meeting rooms talking about how to get the buzz going on new or established authors (I feel like I’ve sat in on my fair share of them…). It’s the most discussed subject in books, apart from ‘how do create a crossover sensation?’(grrrr, the hours wasted on that little gem..), but it’s talked about for a reason, because you can’t beat it. Don’t get me wrong, a well-placed ad campaign can work wonders, but these are few and far between on debut novels, and quite rightly too. I like the idea of a book going out on the shelves without that sort of fanfare. Love the thought that your proof copy has landed in the right hands, and that the story has been enough to persuade booksellers or librarians that this is the next book that their customers have to read…. It’s a risky and romantic belief this. I remember our staff room at Ottakars being jammed full of unread proofs, each of them raved about by reps as the next big thing. 90% of them would sit there for a few months, until we couldn’t open the door anymore, leaving us no option but to fill the skip with them (even the charity shops didn’t want them…). But I’m not going to linger on that thought. 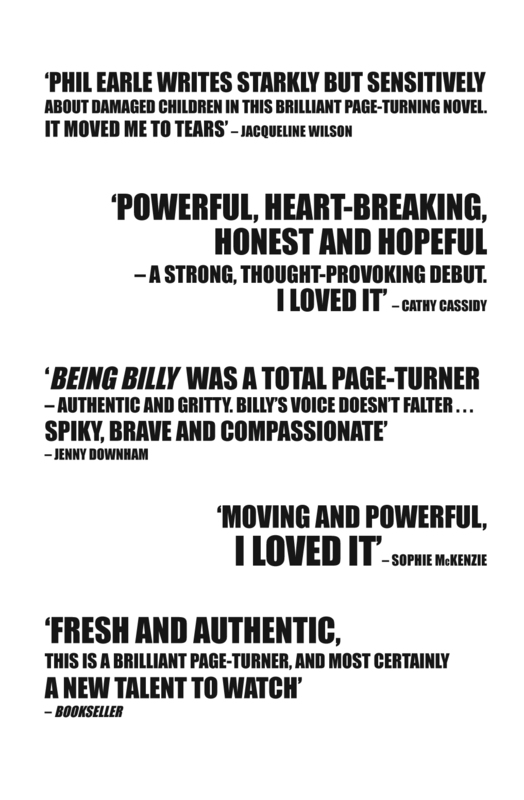 I’m just going to have faith that the jacket and the copy will be enough to entice booksellers to give ‘Billy’ a whirl. The other thing that I hope will help are the quotes. One of the many great things about working in bookselling, or publishing, is that you get to meet people, people whose opinion counts, and so when I got the deal with Puffin I wrote to some of these good folk and asked them if they had time to read my book. And do you know what, they did. …But I needn’t have worried, because these good people came up trumps, and it was the most brilliant confidence boost you could ask for. What’s even better is that they said I could tell other people what they thought, and so, the good people of Puffin have put some of the quotes together, laid them out snazzily, and will put them on the back cover and inside the book. I really hope that these kind words do the trick. I hope they entice people, booksellers, librarians, Joe Public, whoever, to give this a whirl, and spread the word. Have a look below and tell me what you think…would you read this book? ?